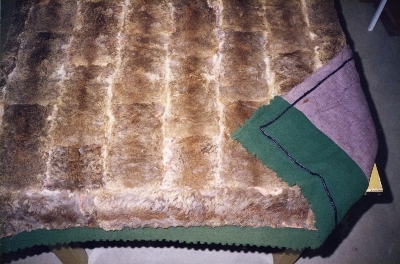 This possum skin rug was purchased by The Pioneer Women's Hut from Bruce Wright's shop 'Mountain Gum Antiques' in the Parade Tumbarumba in 1995. It is said to have come from the district and to have been in use since c.1940. The possum skin rug is displayed occasionally in the museum. Skin rug of kangaroo or wallaby skins. Rectangular pieces stitched together.